JayBay House is situated in the picturesque surfing town of Jeffreys Bay in the Eastern Cape - a mere 75km (a pleasant 40 minute drive) from Port Elizabeth airport. Jeffreys Bay is a wonderful destination whatever your interest. It is situated at the start of the scenic Garden Route and there are numerous game farms nearby, making spectacular game drives a ‘must’ for any visitor. No mention of Jeffreys Bay would make sense without referring to the glorious, unspoiled beaches including the world famous surfing beach, Supertubes. All manner of watersport and outdoor activity is possible with the area’s natural beauty and year round sunny weather. JayBay House features 8 Double/family, en-suite rooms, (family rooms sleeps up to 5). Family rooms are set up for a family with a king bed for mom and dad, and 2 single beds for the kids and cots are available on request for smaller children. All rooms and facilities are finished to a high standard, entire house is fully air-conditioned and the house features panoramic 180 degree sea views from the lounge on the upper level and also the sea facing rooms. Rooms have king beds, an en-suite bath/shower room, television with dstv channels, digital safe, coffee/tea station, and you may make use of all the facilities at JayBay House which also includes free wi-fi and free secure parking and use of our swimming pool. Our rooms are all air- conditioned and each one has it's own mini bar fridge. Rooms are serviced daily, we have sea facing rooms with a balcony and superb sea view, we have rooms on the upper level and rooms on the ground floor level with a garden view. Our rates are fully inclusive of bed and an ample nutritious breakfast. We bake fresh bread daily and all our ingredients are sourced locally and served fresh every morning. The entertainment areas, both indoor and outdoor, are designed to ensure that you have an unforgettable experience. We have a swimming pool, BBQ facilities and everything else you might need for a stylish recreation on site. The house is within walking distance to the beach, shops, restaurants and bars in the heart of Jeffreys Bay. Our check in time is any time after 3pm on the day of arrival and check out is before 10am on the day of departure. Please not we do not allow pets as it has caused too many problems in the past. The town is delightfully old-world although it has a vibrant and young energy. You will find your favourite spot, from laid-back surfer to sophisticated and urban at the many recreational venues. The shopping covers anything from the unique ‘once-off’ art finds to surfer gear and mainstream malls. What a lovely guest house, thank you very much for the warm hospitality. Sara & Geert. Absolutely perfect, goeie gasvrou uitstekende ontbyt, liflike kamer, Dankie Adri ! From the airport, follow directions to N2 Humansdorp (Cape Town) or when you take direction N2 Grahamstown and then N2 Cape Town. 70 kilometres further on the N2 take the N2 off-ramp 676 Jeffrey's Bay, (not Jeffrey's Bay East). Turn left 300 metres past Caltex Garage Grocers into De Reyger Street, 100 metres further (opposite the Shell Garage) left again into Verbena Circle. We are just on top of the hill at number 8, awaiting your arrival! JayBay House is an Afristay Valued Member. 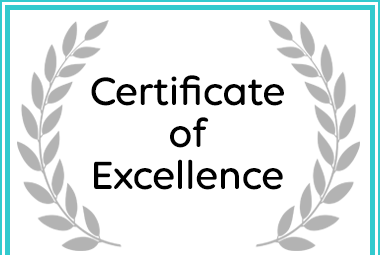 JayBay House in Jeffreys Bay Received a Certificate of Excellence Award.